You can download a podcast, to hear it offline whenever you want. You can stream, to hear it when you are connected to the Internet. And you can subscribe to an RSS feed or a service like Apple Podcasts to automatically download episodes when they come out. 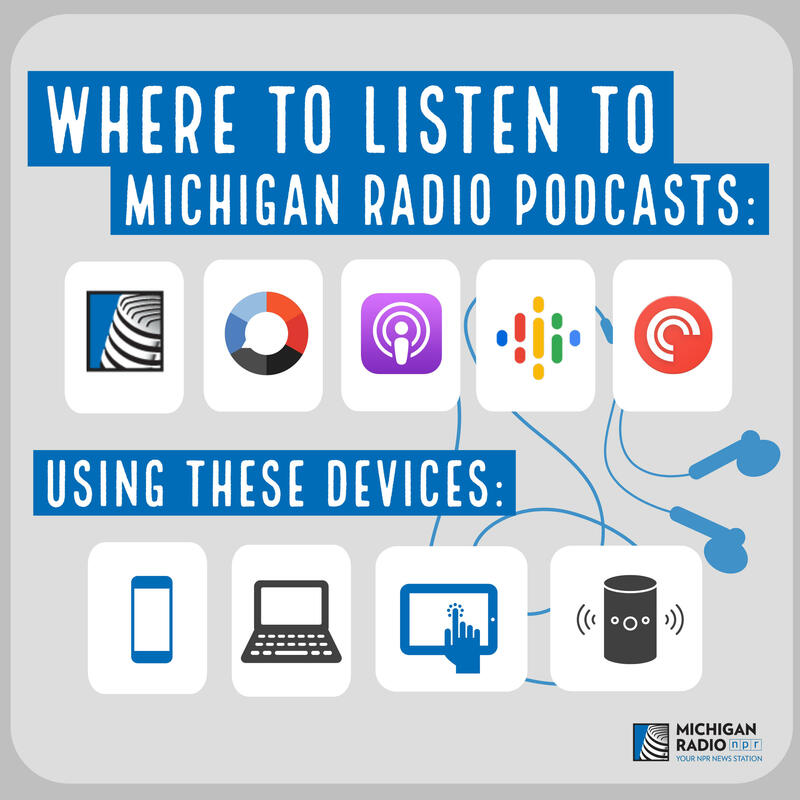 Wondering what you can listen to from Michigan Radio? Check out our podcast directory to get started. How about the Michigan Radio app? 1) You can download the Michigan Radio app on iPhone or Android devices. 2) Find the three-line menu icon (☰) on the top left, then click it. 3) Select "Podcasts" from the menu. 4) Choose which podcast you'd like to listen to and click on it. 5) From there, you'll be taken to a page with the latest episodes from that podcast. Click on the episode you want, and it will start streaming through your app! NPR One is an audio app and website from NPR that "connects you to a stream of public radio news, stories and podcasts curated for you." You can choose to listen to a stream of news from NPR and other local NPR stations, or you can search specifically for station-produced podcasts. If you have an iPhone, this app is already pre-loaded. Just look for the purple Podcast logo. 1) Once you have the app open, go to search or browse to find shows to select. 3) Once you've found a show that you like, click on it. 5) Clicking on an episode will stream it through your phone. You can download it by clicking on the cloud icon. This will save it to your phone and library so you can listen to it while offline. 6) If you need more in-depth help, check out this helpful post. 1) You can download Google Podcasts from the Google Play store. 3) Enter the podcast name you're looking for (or a general topic). 4) Once you've found your podcast, tap it, and click "Subscribe"
For more info on how to use Google Podcasts, check out this nice guide. Apart from the Apple Podcasts app, all of these can be used on any device (including Android phones). But what if I want to use Google Home/Alexa? Here is a handy (30 second!) video on how to set Michigan Radio on your speaker. Believed: How did Larry Nassar, an Olympic gymnastics doctor, get away with abusing hundreds of women and girls for two decades? Believed is an inside look at how a team of women won a conviction in one of the largest serial sexual abuse cases in U.S. history. 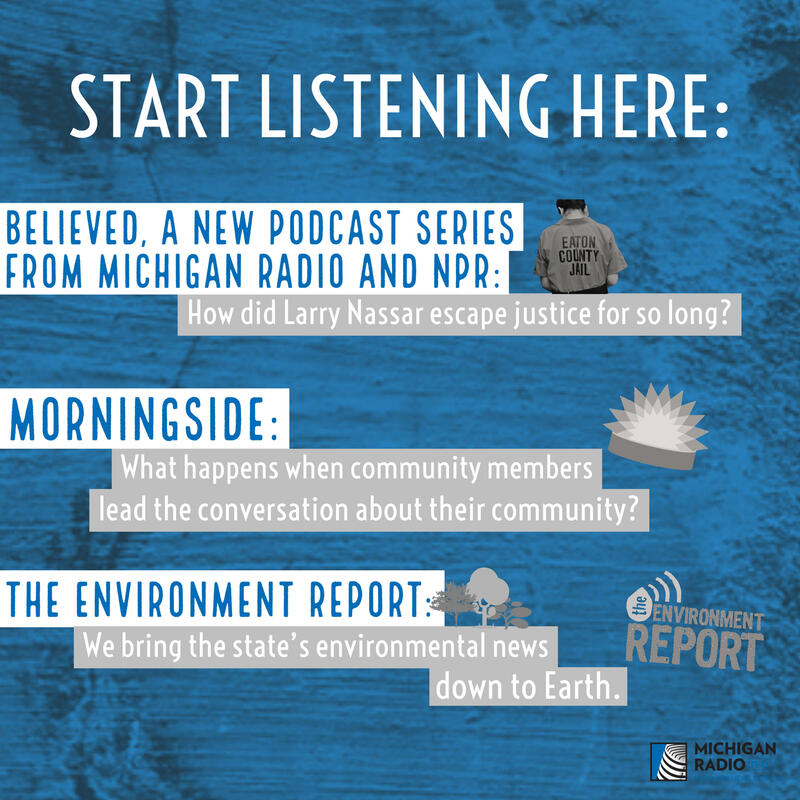 The Environment Report: Get Michigan's latest environmental news with Lester Graham. Stateside: Find Stateside's individual segments along with the entire show on this feed. The program covers a wide range of Michigan news and policy issues — as well as culture and lifestyle stories. Issues & Ale: Issues and Ale is an event series designed to engage people in conversations about important issues facing Michigan in an informal atmosphere. This is the audio from those community events. It’s Just Politics: Join Zoe Clark and Rick Pluta every Monday morning for a fast-paced spin inside Michigan politics. Political junkies get your fill! MorningSide 48224: What happens when community members lead the conversation about their community? MorningSide 48224, a community-led podcast, will endeavor to find out. We hope this helps you get started. Happy listening!